New Gigabyte laptop is a 15.6” machine with a 31.6mm thickness, a i7-2630qm quad-core processor and a fast GeForce GT 550M graphics card. It may not be a MacBook Air or a Samsung 9 Series, but the Gigabyte P2532N has managed to slim things down while maintaining quality performance. According to Gigabyte, their latest 15.6” machine is the thinnest 2nd generation Core i7 laptop to hit the market yet and will also come with interchangeable lids. The Sandy Bridge Core i7-2630QM equipped P2532N is designed for multimedia purposes and also features an impressive Full HD 15.6” screen with a 1920x1080 pixel resolution. The laptop also comes with a 500GB HDD, an NVIDIA GeForce GT550M with 2GB of RAM and Optimus technology, HDMI, and 2 USB 3.0 ports. The hardware is very impressive, but Gigabyte has managed to fit that all in a 31.6mm thick case. 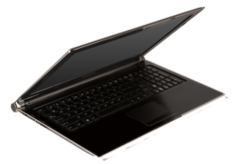 To prevent overheating on the machine, Gigabyte outfitted the laptop with two sizeable ventilation openings on the back. 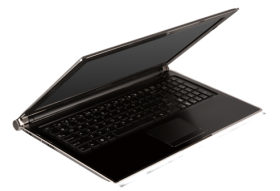 The Gigabyte laptop will also have access to interchangeable lids to allow for user customization. The lids include Yellow, Red, Orange and Black colors and add a little flare to the notebook. While being the thinnest Sandy Bridge i7 laptop on the market is a nice quality, it shouldn’t be long before another manufacturer comes along with a slimmer notebook. As of now there is no word of release or pricing for the laptop, but TweakTown managed to get their hands on a review unit and sampled it in the video below.